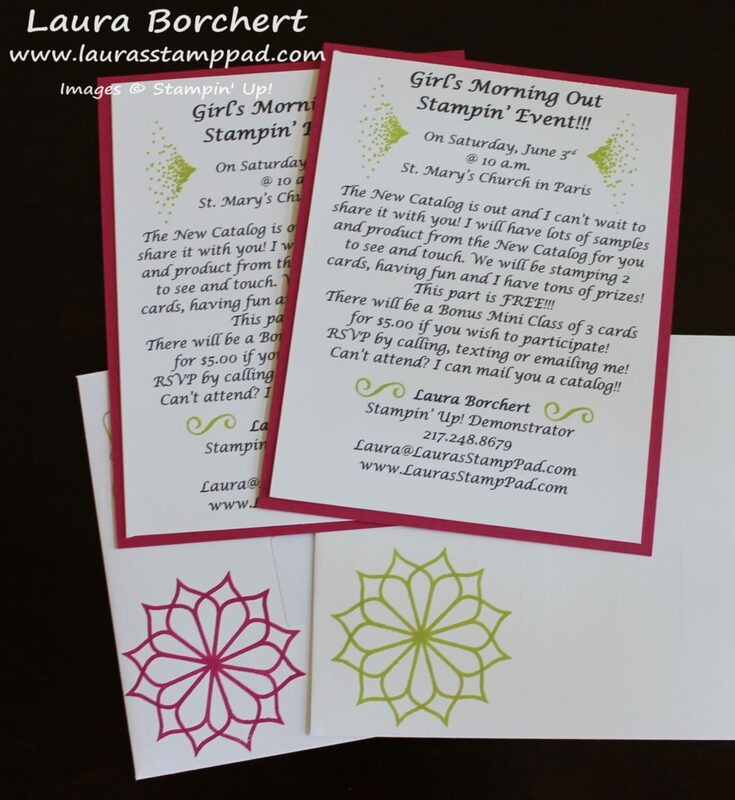 Girls Night Out Stamping Event!!! 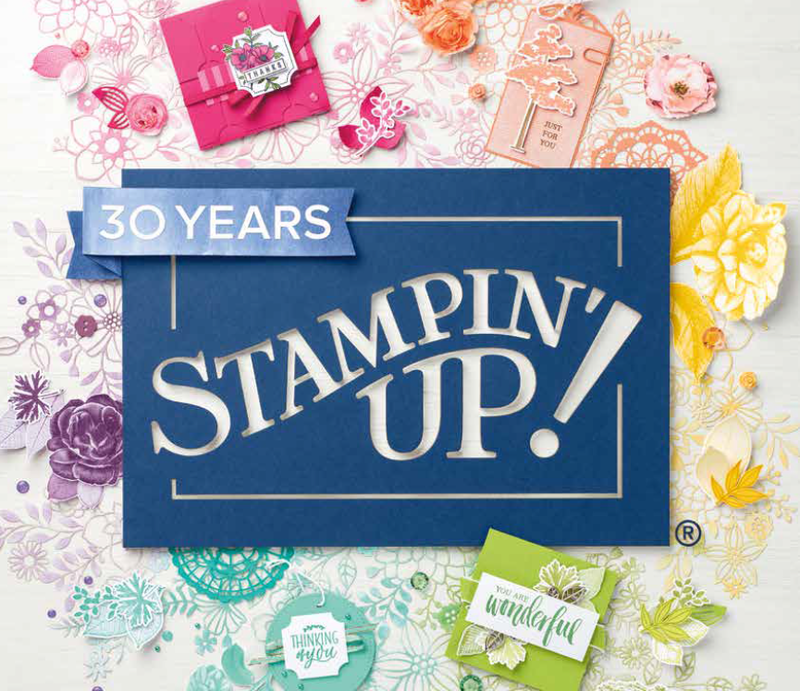 Every time the New Catalog comes out in June, I hold a Girls Night Out Stamping Event! Don’t worry, there is a Girls Morning Out as well since I do it at 10 a.m. and 6:30 p.m.! I also like to travel over to see my Paris girls too so I have one over there on a Saturday! I thought I would share the invitations with you all today!!! Everyone is welcome to either of these events! Click here to see the Facebook Events for more information and RSVP! You can also email me your RSVP as well! These invites were super quick and simple to create but adorable and fun too! I used the Eastern Palace Suite and just had fun with it! 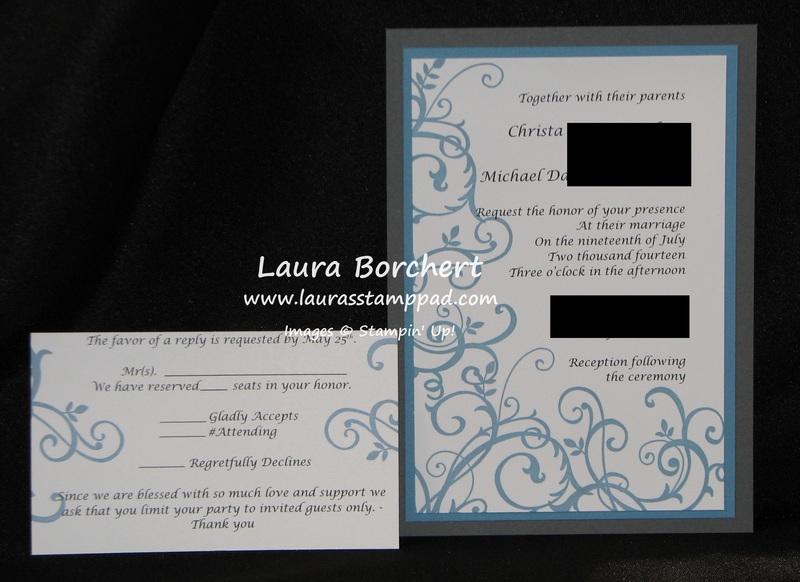 I started by printing 4 invites on one sheet of Whisper White cardstock. Then I cut them into 4″ x 5-1/4″ rectangles. 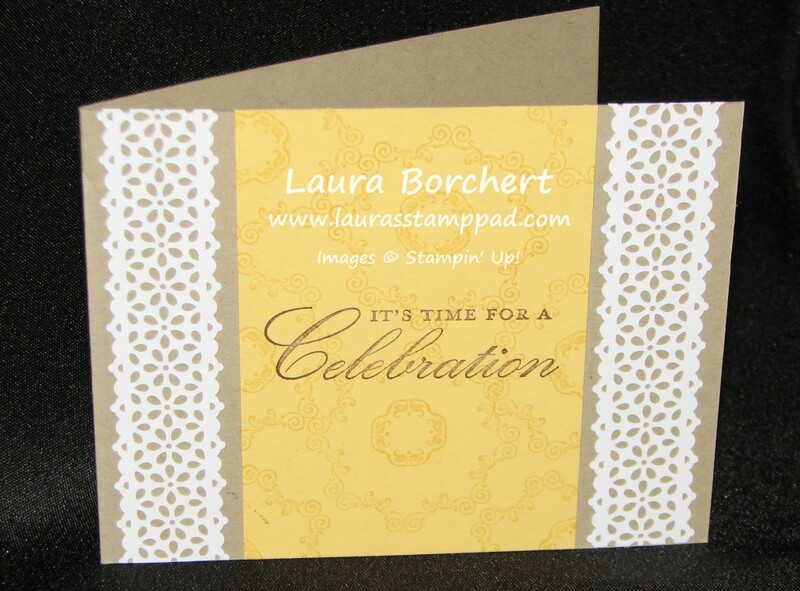 Using the Eastern Beauty Stamp Set, I stamped accents onto the invite for a little POP of color. I used the NEW In-Color, Lemon Lime Twist. I think that color is super fabulous for Summer time!! Finally, I layered the invite onto a piece of Melon Mambo measuring 4-1/4″ x 5-1/2″ which is a quarter sheet of cardstock. There is no waste there as I use every bit of the paper. I thought I would decorate the envelopes a little too but just a little bit more fun! Using the medallion, I stamped it once and then inked it up, rotated it a bit and stamped it again to create this flower. How amazing is that?!?!? I just love it! See how quick and simple that was to create! This can be changed up for a baby shower, bridal shower, graduation party, birthday party or any type of celebration! I hope you try it out yourself for your next upcoming event! If you are local to Maryville or Paris (Illinois), I would love to have you join in my Girls Night (Morning) Out Events showcasing the New Catalog in June! Months ago I started working with an amazing couple who were planning their wedding! Their colors were those in a sunset – Real Red, Melon Mambo, Pumpkin Pie, Tangerine Tango and Daffodil Delight. You know how much I love my bright colors!!! I really enjoyed creating the perfect wedding suite for this couple!!! 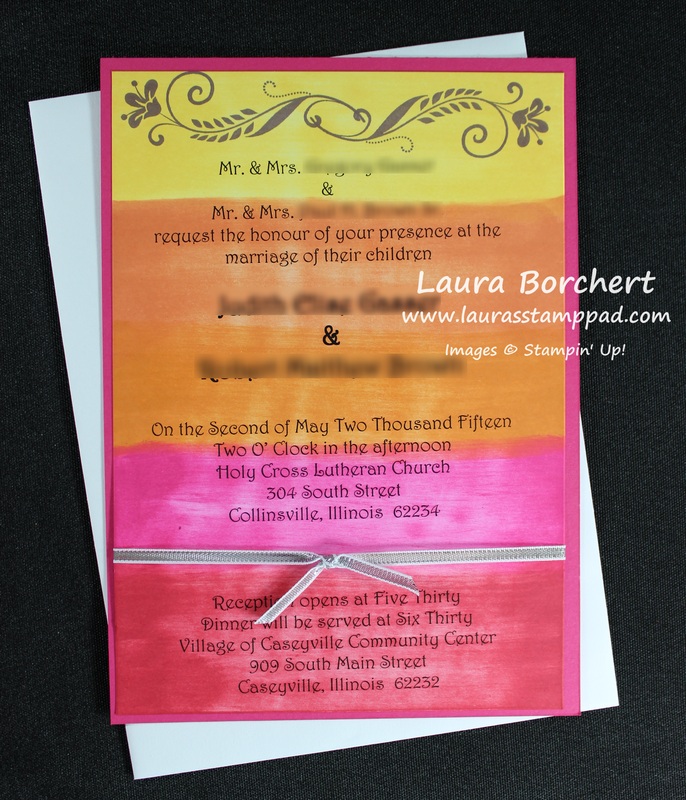 The invitation was a 5″ x 7″ Invite printed on Whisper White and then I used my Sponge Daubers to add all of those fun colors!!! My fingers did get rather inky but it was totally worth it!!! I added some Silver Ribbon towards the bottom and stamped the scroll-y flower image from the Flowering Flourishes Stamp Set in Perfect Plum at the top!!! Then I layered it onto a piece of Melon Mambo!!! The Hotel Card and RSVP cards were printed on Daffodil Delight and Pumpkin Pie respectively with the Perfect Plum stamped image on them as well!!! How adorable are these? The Bride came up with this amazing saying that is a sweet as the cake pops they were attached to! 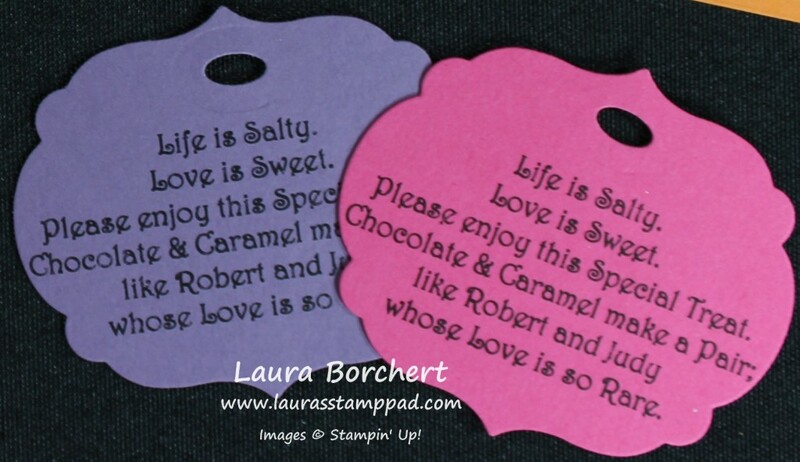 The tags were printed on each of the colors – Perfect Plum, Melon Mambo, Daffodil Delight, Real Red, and Pumpkin Pie!!! I used the Label Collections (now retired) Framelits to cut them out and the little oval for the ribbon to slide through was created with the Chalk Talk Framelits!!! Love it!!!! I really enjoy working with Brides and Grooms to create their perfect wedding! Each bride has such amazing ideas and I love it! You can check out some of the others I have created here! If you are getting married, planning a birthday party or anniversary party or any other type of celebration, let me know! 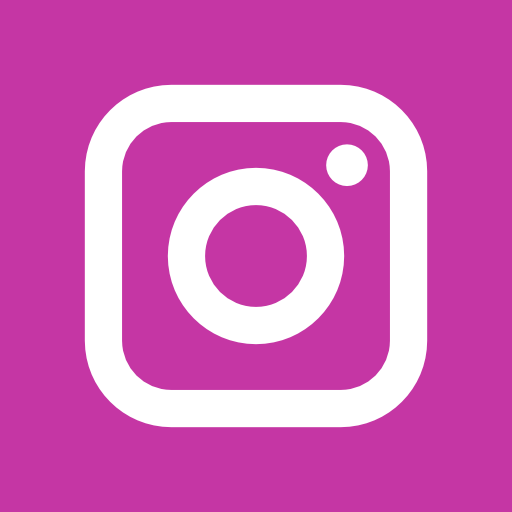 I would love to help you create the perfect piece for your event – Invitations, Programs, Save The Dates, Place Cards, Favor Tags, and much more!!! I worked with this Bride to create the perfect Wedding Invitations and of course we had to add in a matching RSVP card. After she saw how amazing the two went together, she asked if I could create Thank You Notes as well! Of course!!!! I created two different styles so she could use one for her Bridal Shower and one for her Wedding. 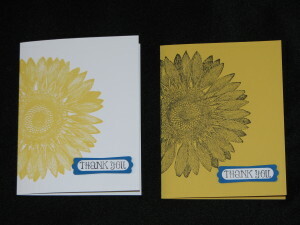 I even stamped the sunflower on the inside corner as well! 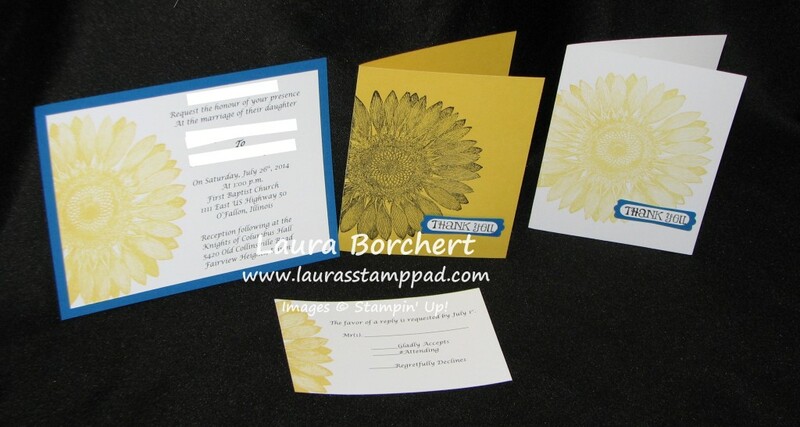 I love how the sunflower theme was carried out through all of the items. I used Pacific Point & Daffodil Delight for this card. 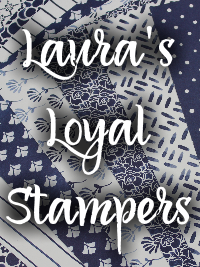 Of course you can see I used my Modern Label Punch & Word Window Punch! Love it!! If you are planning a Birthday Party, Wedding, Anniversary Party, or any other type of party, I can help you customize the perfect invitation, party favor, or thank you note for your event! Together we can come up with the perfect piece to match your colors or theme. I can create the sample and help you get the supplies for you to be crafty and create the perfect piece or I can create it all for you!!!! 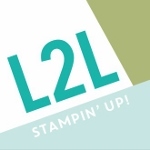 Email me today if you need help with you upcoming event! 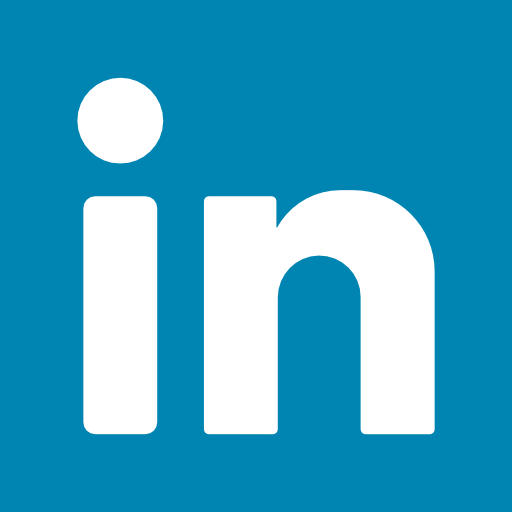 For more samples, check out this page! Or Girl!!! Is this card not precious or what? I created this for a friend of mine who is going to be a Grandma to a little baby boy! I used the Epic Alphabet Stamp Set which is a photopolymer set so that means it is completely clear and you can see your stamping placement perfectly!!! Love it! 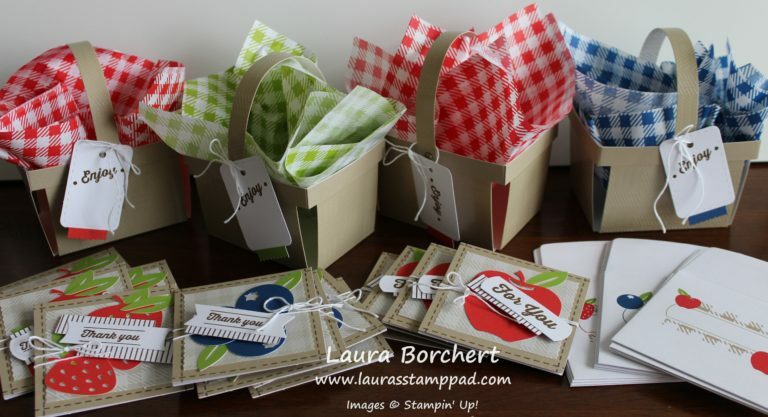 I stamped the letters in Stazon so I could color them in with my Pear Pizzazz & Pool Party markers! 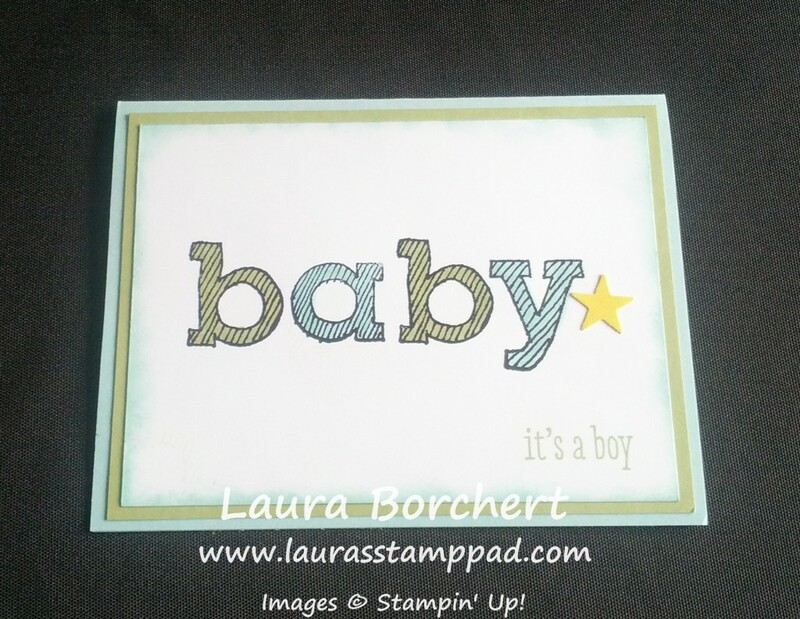 I added the “it’s a boy” greeting from A Dozen Thoughts Stamp Set (which also has an it’s a girl greeting)! You could always leave off the gender greeting and make this card in yellow and gray or another gender neutral color to have on hand for your next baby card need! I thought the card needed just a little something more so of course I pulled out my Itty Bitty Punch Pack star punch and added a little Daffodil Delight star on there! Adorable!!!! 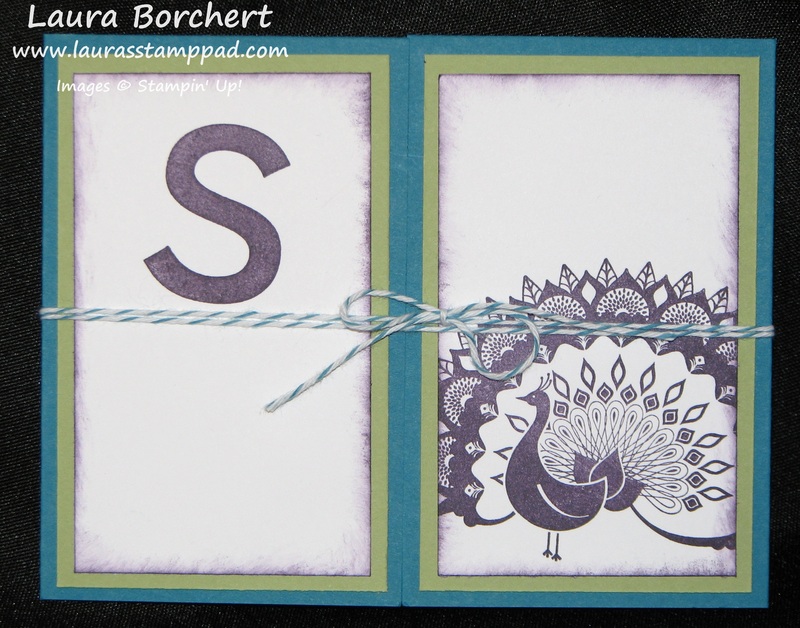 What are some of your favorite saying or words that you like to spell out on your cards with the Alphabet Stamps? Leave me a comment down below! I’m having a hard time coming up with short words although I did do this super cute card!!! Wedding Season is in full bloom! That means there are lots of Wedding Showers taking place as well. Well if you are in charge of an upcoming Wedding (or Baby) Shower and need fabulous ideas or help with making them, I am here for you! I would love to help you with your crafty side and make amazing shower invites, favors, etc OR I am more than happy to make that perfect piece for you! 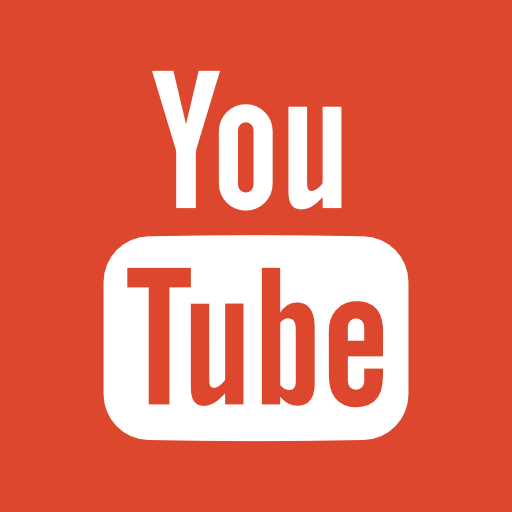 Leave me a comment down below and we can get started! 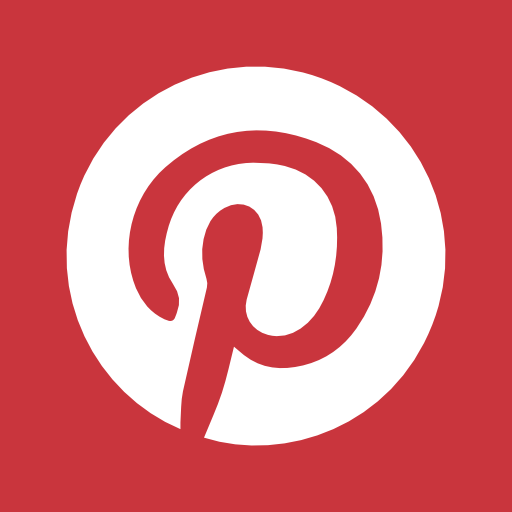 Now for those fabulous ideas….. These fabulous Bridal Shower invites were made for a friend of mine who is having a Rustic/Elegant Wedding theme! That seems to be another popular theme lately! I played around with a few samples before we landed on this one. The one above was created with the Daydream Medallion Stamp Set and matching Floral Frames Framelits!!! I love playing with this stamp set. 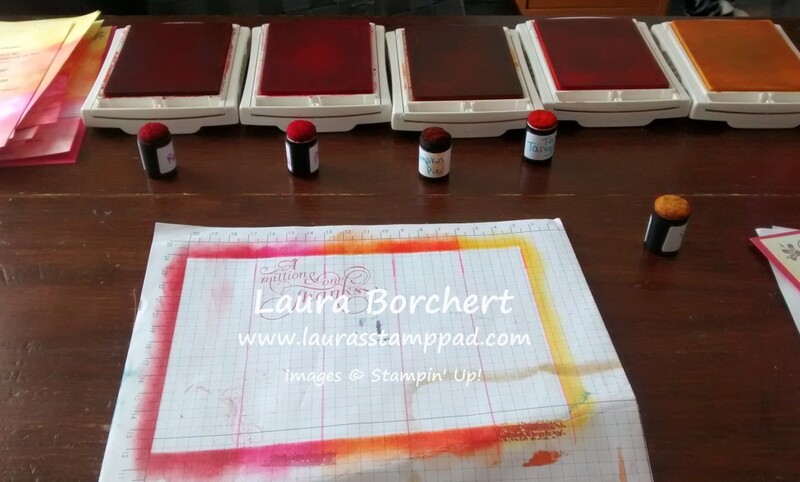 I started with a piece of 8-1/2 x 11 Very Vanilla cardstock and just stamped all over in So Saffron and Crumb Cake (sometimes stamping a few times before returning to the ink pad for that variation of color). 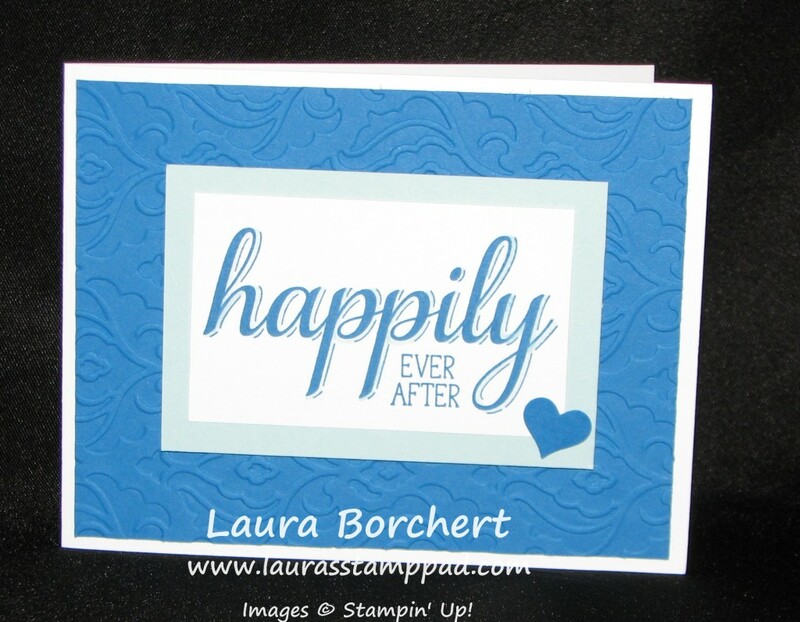 Then I took the stamped piece and cut it into pieces for multiple cards! This made making 40 invitations go much quicker than stamping each piece individually! This was another option that I created for my friend to pick from. I used the Daydream Medallion Stamp Set on the center piece of So Saffron and then I used the Delicate Details Lace Trim (which is retiring on June 1, get it before it’s gone)! Another fabulous Shower invitation!!! I love working with Brides to create the perfect piece for their wedding! 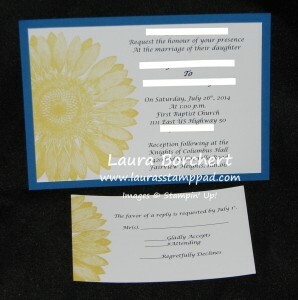 I had a Bride come to me for wedding invitations for her quickly approaching wedding. She said the theme/colors were Peacock colors!!! I love love love these colors – Midnight Muse, Night of Navy, Elegant Eggplant, Island Indigo and many more variations! So first things first, get the right color combination! There are so many different combinations and color schemes! She went with Island Indigo and Elegant Eggplant! 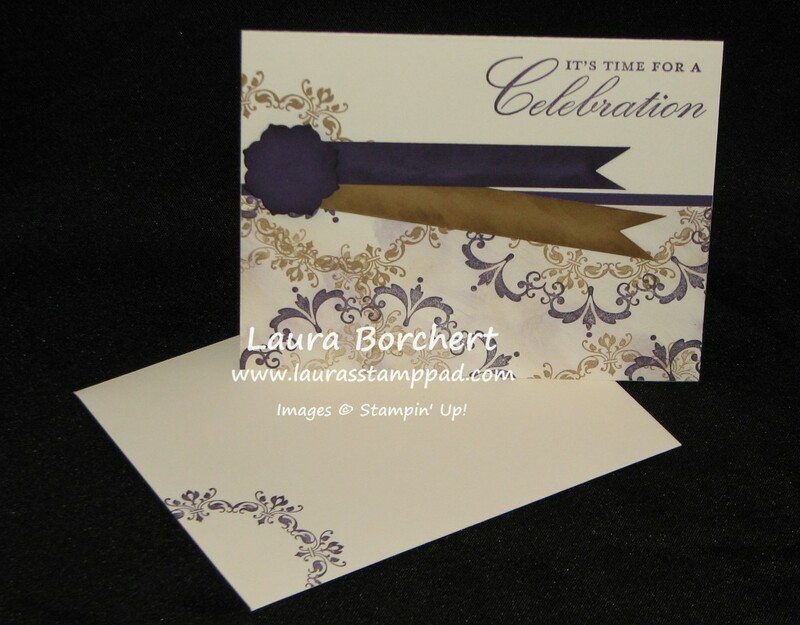 Now onto the style of the invitation! She really loved the gate fold style (where it opens on both sides, meeting in the middle to close). Then she saw the perfect invitation…..Tying The Knot!!! This style has been very popular and she instantly loved it!!! As you open the invitation, there is a piece of Island Indigo Baker’s Twine that ties into a knot! 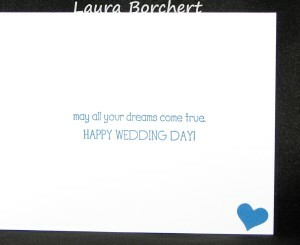 It is super cute and a fun way to share with others that you are Tying The Knot! 🙂 I also created matching RSVP cards that had a peacock on them as well! Here is another Peacock wedding using a little Gumball Green in with the mix!!!! As always I love doing weddings, invitations, programs, place cards, and any other paper item you may need for that special occasion! You can check out more wedding items by clicking here and here!!!! 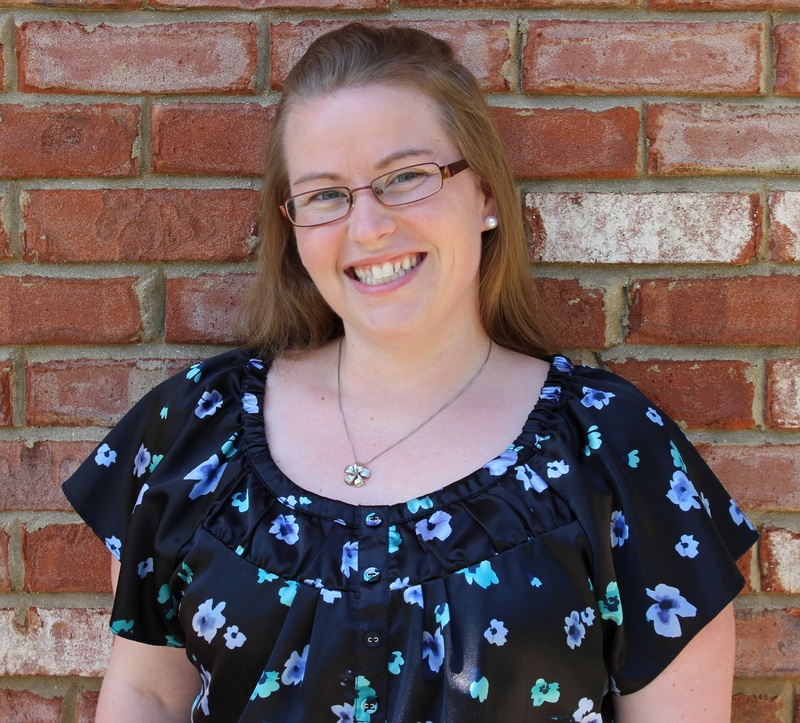 If you need help with any upcoming events you may be hosting, reach out to me or leave a comment down below! I would love to make the event the best ever!!! As you all know, I LOVE weddings and have started working with Brides to create fabulous custom pieces to make their day even more special! I have been doing lots of wedding lately but I am waiting to post them till after the wedding! Well today I am sharing with you some Wedding Programs that I recently did for an amazing couple!!! Okay, so first of all I love the colors – Melon Mambo and Night of Navy!!!! (Melon Mambo was one of my wedding colors 🙂 ) These were very basic but super fabulous! I did some in Melon Mambo and some in Night of Navy which was super cute because then they were able to enjoy both colors! Also, these are perfectly personalized with the “R” monogram! 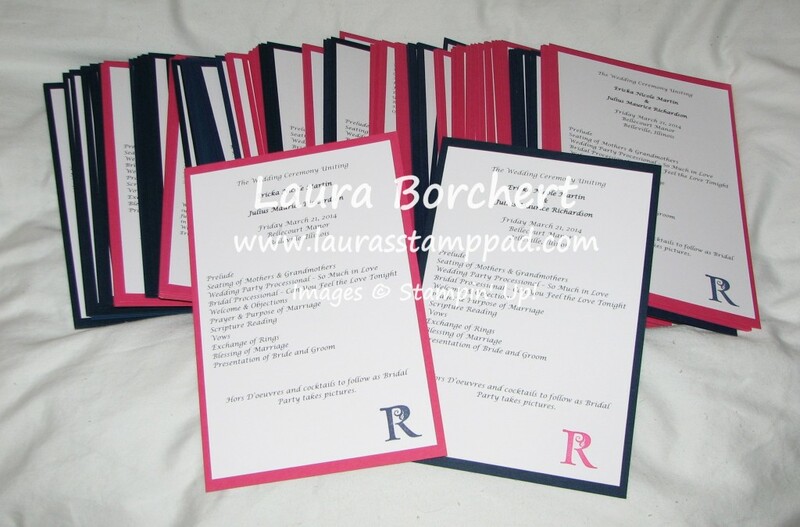 These programs were double sided – one side was the order of events and the other side was the wedding party and family members! I loved making these and when the Bride came to pick them up, she was so excited and bursting with happiness! I’m so happy I was able to add this special touch to make her wedding day even better! If you are getting married or planning a party and need help with the invitations, programs, thank you notes, party favors and so much more, reach out to me! I’m happy to help you! You can check out more samples that I have created here and here! What do you think?? I think I nailed it on the head!!! 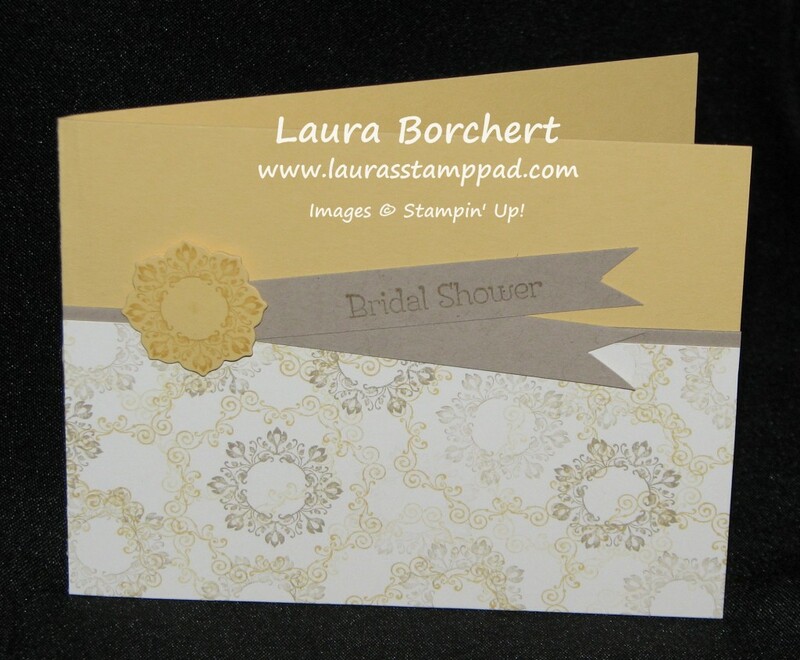 I used the Daydream Medallion Stamp Set which has quickly became my go to stamp set. You can check out more samples here and here! LOVE IT! 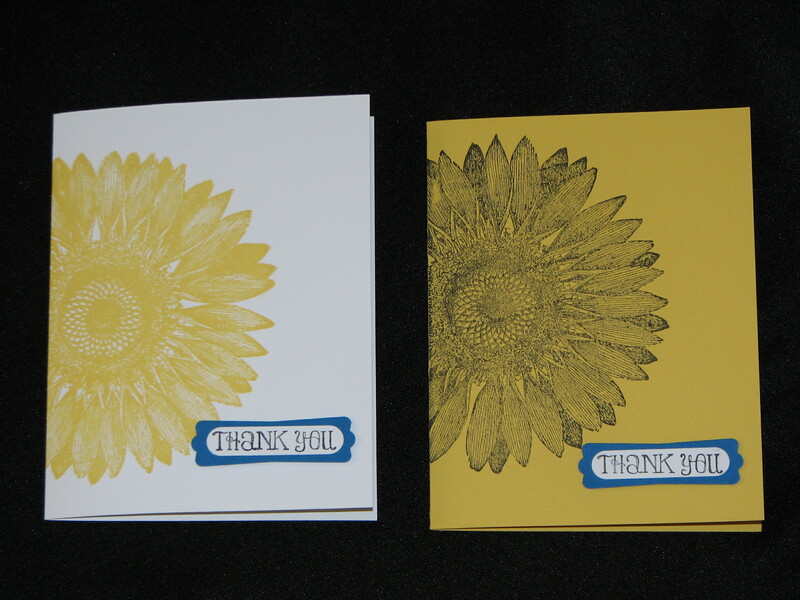 I randomly stamped all over and then added a little more ink with my sponge daubers for the bottom half of the card. Then I die-cut all of the smallest flowers from the Floral Frames Framelits and brushed the edges with Elegant Eggplant ink and my sponge daubers. I brushed the edges of the banners as well. Here are a few of the steps I took when making these. Remember assembly line is the best way to make multiple cards! 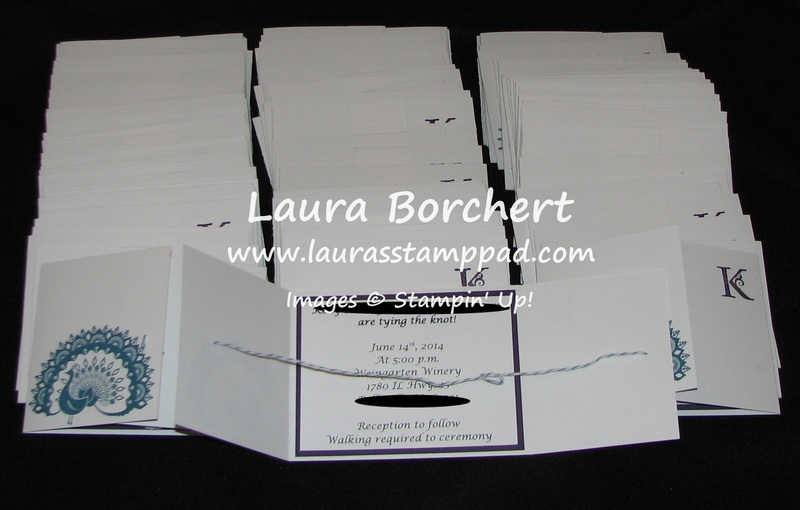 I even stamped a little on the corner of the envelopes to make them match and a decorated envelope in the mail is sooooo exciting to receive! I love how they turned out and the Birthday Girl LOVED them too! HAPPY BIRTHDAY, Sue!!!!! If you are having a party or wedding and need help with the invitations, programs, party favors, and more let me know and I would love to help you make the perfect party!!! !